Journal : Journal of Nervous and Mental Disease, vol. xiv. Paris : Gustave Masson, 1887. Description : [1 l.] pl., 541-553 p. ; ill.: 1 photo., 2 pl. engr. ; 24 cm. Photographs : 1 photograph (process unverified). Subject : Brain — Congenital cerebral lipoidosis ; Amaurotic idiocy ; Tay-Sachs disease. Author caption: BY B. SACHS, M.D., NEW YORK. Sachs was the editor of the journal. Read before the American Neurological Association, July, 1887. Eponym: Sachs disease — Tay-Sachs disease. Revised: Sachs (1892) A further contribution to the pathology of arrested cerebral development (amaurotic family idiocy). New York: J. Nerv. & Ment. Dis., v. xix. ; pp. 603-607. Revised: Sachs (1896) A family form of idiocy, generally fatal, associated with early blindness (amaurotic family idiocy). New York: J. Nerv. & Ment. Dis., v. xxi. ; pp. 475-479. Other studies titled as Amaurotic family idiocy followed in 1910 and 1929. Index Medicus: 20206551460, 11204271030 (reprint), 21701481020. 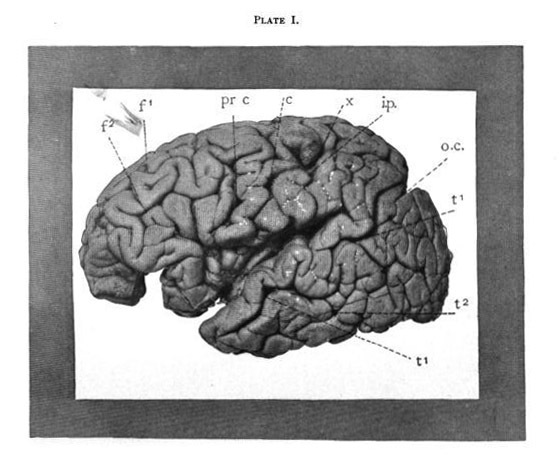 The brain was immersed at once into Müller's fluid, and as soon as hardened the brain surfaces were photographed. [footnote 1].